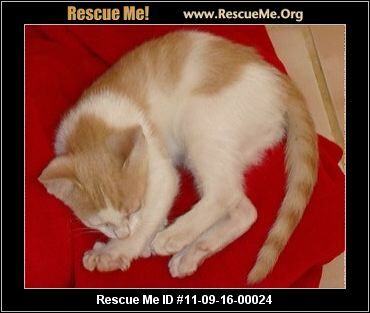 833,706 animals have been adopted on Rescue Me! I am happy and excited to report that Bev found her forever home. She came to our shelter as a three month old kitten in 2011 and had been there almost her entire life, she was timid and shy. I just became the shelter manager in December, 2017. 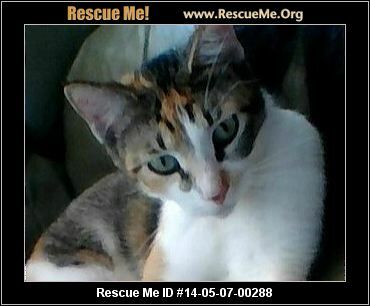 I was surprised that no one had adopted this beautiful unique baby girl, a very nice lady saw a picure of another one of our kitties on Rescue Me that had been at the shelter since 2014 and decided to adopt them both. Never give up there is a home out there for all of them if the right person comes along. Thanks for your time and interest in Bev. It has definitely been an uphill battle trying to find good homes for these American polydactyl kittens. Our American polydactyl, Rabin, has been adopted to an amazing family looking for a friend for their little blue Russian kitten. Her name is now Chloe and she will be living with an amazing family that has lots of love and another little girl kitten to play with. I am so lucky to have met the families that I am adopting out these kittens and it is so good to see that there are such amazing people out there willing to open up their homes to these animals in need. With three of our foster kittens adopted, we just have the one, black female, left. Xena, who happens to be a very unique kitten. 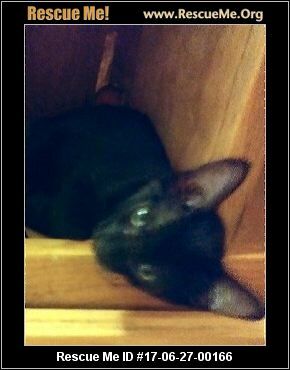 Having 24 toes, female and black with green, yellow eyes, she is a very unique and lovable kitten. I have faith that the right family is going to come along and adopt her. I'm honestly blessed to be able to give these babies to homes that they deserve. It's time that they found peace and comfort coming from the horrible life that they could have had on the streets. I just wanted to say thank you to the people that run Rescue Me and I wanted to also say thank you to any other foster parents out there and rescues opening their homes to these sweet animals. I'm really glad I get to be part of such a positive force. Very happy to find a home for our little foster, Little Bear. 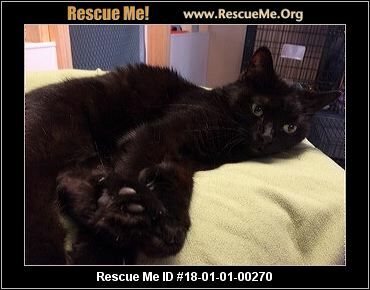 He was adopted to a wonderful woman in need if a playmate for her poor cat that lost her friend a while back, another American Polydactyl who passed away last year at the age of eleven. Little Bear has been adopted by an amazing woman who has a true love for cats. So much so that we talked for hours about our research and study into these magnificent animals. His two sisters are still waiting to find their homes, but are doing just fine. Little Bear's transition into his new home was one long drive and a two hour meet and greet with his new mum. He was so happy, he went off to play as we left him not being too upset and right at home. So glad we were able to make that happen. This little kittens story started off being birthed in a sewer, thrown in a bush and left by his mother into a natural, comfortable loving home with new friends and a loving mum. Thanks, Rescue Me! 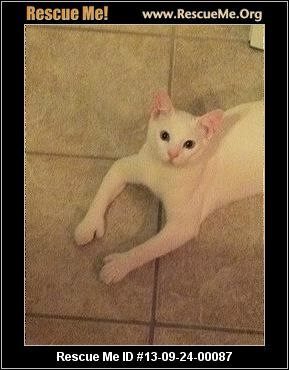 We were searching for a Hemingway Polydactyl to provide a loving home after six months without our beloved cat. 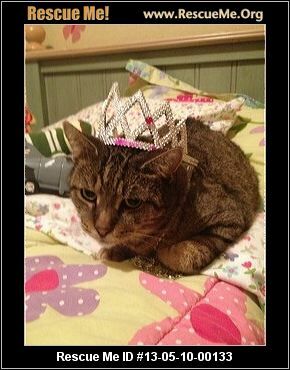 Our beloved cat made us fall in love with cats and our heart ached from her loss to a serious health problem at age 17. Our home was empty without the activity and love of a cat. 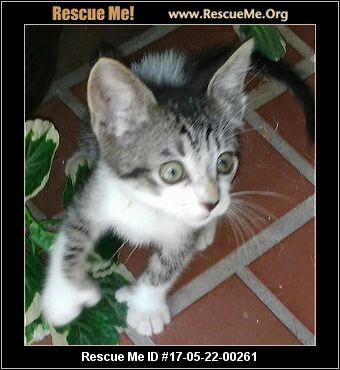 Our search included finding Rescue Me website and the posting of a kitten that was placed in a dangerous situation. It was the fast action of Donna Dellapella, from Holiday Florida, that saved her life. She observed a man roll down his window and drop this two week old kitten onto a busy roadway. Donna observed this heartless-mean man dropping the kitten. Donna placed her vehicle in a place to at least temporarily prevent the kitten from being run over. An anonymous gentleman also observed the kitten being dropped. He stopped his vehicle and got out and directed traffic helping protect Donna and the kitten so Donna could secure the kitten to safety. 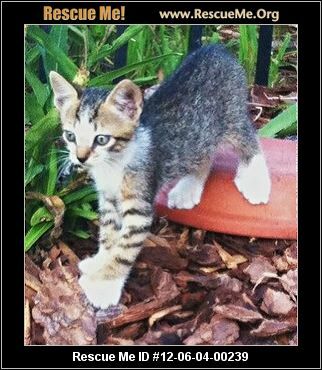 Donna was the kitten's saver, mother, and a foster parent. From the information provided on Rescue Me, I called Donna. She accessed that my wife and I would be excellent candidates to adopt the kitten. Ultimately, I was willing to fly RT from El Paso, Texas on July 4th to complete the adoption. We had a three week trip to Europe for our daughter's wedding in Italy. Donna was willing to keep this kitten for us. The kitten was in excellent condition (thanks to Donna in her loving care) and the kitten (we named Bella while in Italy) has adjusted well with us providing lots of attention, love, a safe environment, and Bella's communication skills are amazing and growing as well as we fall in love with her. We like to think Bella has won the lottery by being placed in our loving home. We thank publicly Donna Dellapelle for her love of pets, for the excellent care of Bella, and Rescue Me for our new buzz saw of activity bringing our home alive! Thank you so much, Rescue Me! 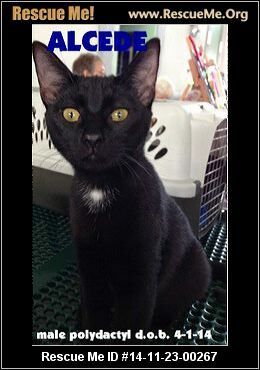 If it had not been for this site, this poor kitty wouldn't have found the perfect forever home. The people who adopted her saw her in posts on here. They actually are flying from El Paso, Texas together. Now that's a dedicated pet owner. I'm so happy for this kitty. She will have a great home filled with love!! Thank you Rescue Me! They wouldn't have found each other had it not been for you. I plan on donating to this wonderful organization. Malachi found a wonderful home with his brother. So happy they could stay together! Thanks, Rescue Me! 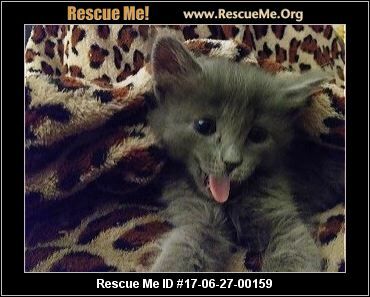 We are super grateful to Rescue Me for helping us find homes for our precious kittens. 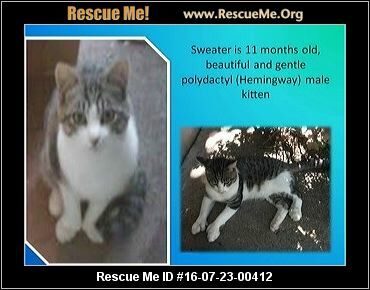 Sweater is a beautiful polydactyl, outdoor cat who was really hard to get adopted because he has just turned one year old. However, yesterday he got in the small wire kennel, that helped us to transfer him from our home to his new permanent home We are very, very grateful to everyone who made this transition for precious Sweater. Tiger and Hayim, were rescued tonight! We are super grateful to Rescue Me, and their new father who drove three hours to come and rescue them! I am very, very grateful! We'll report BK and his brother Gary, who are still available. 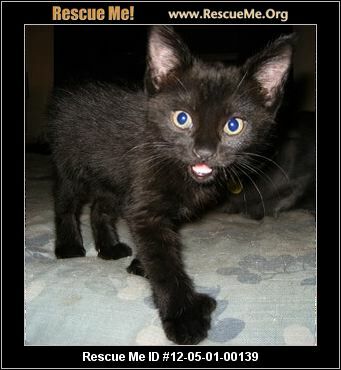 Thank you, Rescue Me, for a wonderful miracle family for our little ones!! Marbles has blended into the family. He has his forever home here with Bella Dona, Nalah and Beau (the cats), Zephyr Ginger and Sweets (the dogs). Thanks, Rescue Me. 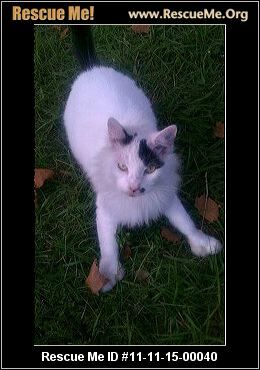 After my beloved cat Shady passed away, I knew that it would take a very special kitty to follow in his paw prints. 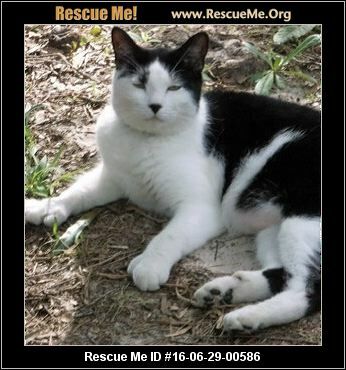 I searched the web, reading countless cat profiles, until I found Ernest on Rescue Me. As soon as I read his profile, I knew that Ernest would be the perfect addition to our family. Ernest is an awesome, loving kitty. We are blessed to have found him and so grateful to Rescue Me for making that possible! Our state has a problem. Cats. We are over run with them. Irresponsible cat owners didn't vet their pets, then dumped them. Those cats started mating with the feral cats. Because we do not have the harsh, brutal winters of our northern states, these cats keep reproducing. And because we do not have a system in place to educate the people, they keep dumping their non-vetted pets. It is a problem. Enter Alcede. Alcede is the offspring of two cats. A sweet young couple was feeding the three females and noticed they all were expecting. Then all three moms gave birth. Eleven babies survived. Some of them were bobtails, some polydactyls. Alcede is a poly, and a full poly at that. The commonly known term for a poly cat is a Hemingway. This sweet couple tried to find homes, but good homes are hard to find here. They reached out for help and furever family stepped up. We took on the entire colony of kittens. Alcede is one of those kittens. We too had a hard time finding good homes. Even the rare breed kittens weren't being scooped up. Then we heard about Rescue Me! We started posting and got a few flakes as usual. Then one email came through. There was a woman who had two homes looking specifically for a poly! She saw Alcede's photo and fell in love. Her application was viewed and approved. Her home check was passed with an A+. Because of Rescue Me, Alcede has a new forever family. He is spoiled rotten and loved deeply. So from Alcede and the staff at Furever Family, we thank you! We found this sweet girl a while back, and she was just placed with her new, forever family! I am so happy for her, and I'm sure she will be happy too! 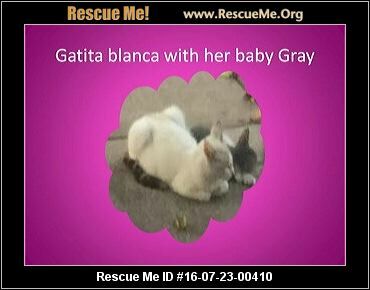 Thank you to this Rescue Me website! Putting my cat Casper up for adoption was a very hard decision for me. 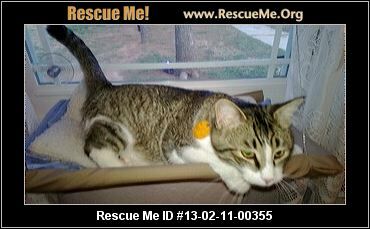 Such a loving cat, I really wanted to find a family that could give him all of the love and attention that he needed. I was so fortunate to have located that family through Rescue Me! Cody and his girlfriend proved to be the ideal match, and made a then hour round trip drive to add Casper to there family. Thanks so much! I knew many years ago that a Hemingway would make my family complete. I recently had the extreme honor to adopt not only 1 but 2 beautiful boys through Rescue Me! A father and son pair that are perfect for our family. Thank you for making this possible and allowing us to complete our family! I knew many years ago that a Hemingway would make my family complete. I recently had the extreme honor to adopt not only one, but two beautiful boys through Rescue Me! A father and son pair that are perfect for our family. Thank you for making this possible and allowing us to complete our family! My friend saw the post and she has now found a forever home with a good friend from work. 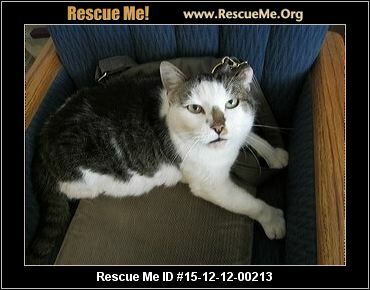 I was greatly pleased that the website RescueMe.Org was there to place my 2 special felines: Neko, an American Bobtail and Hemi, a polydactyl. I had to move and was unable to keep them. Luckily, two wonderful people adopted them in Aurora, OH, and Ashland, KY. Thank you for providing such a site to assist both owners and adopting owners in this replacement that is both heartbreaking and heartwarming at the same time. One of the Hemingways was adopted, and to a GREAT home which is the most important. The girl and mother could not wait to get her even thought they never met. They fell in love with her and provided all the proper care products prior to picking her up, this tells me she will be truly loved and cared for. Thank you so much for your help. The other one is still roaming the streets, along with another stray both kicked out like trash by the same owner. She decided having a romance was more important then her commitment to her pets, or anyone else. This is very frustrating but at least I had them spayed via FCNMHP, what a life saver. The one stray had already 2 litters prior to me being able to fix. Like we need more strays. So without you there would be more unloved animals, but I know one who is truly loved! Thank you! 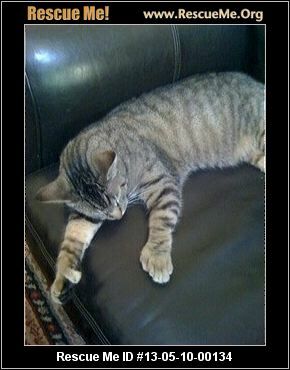 We posted a Hemingway Polydactyl kitten on RescueMe.Org, and within 24 hours we found him a new loving, permanent home. We were sad to see him go (so hard not to get attached when fostering!) but very happy we were able to place him so quickly. 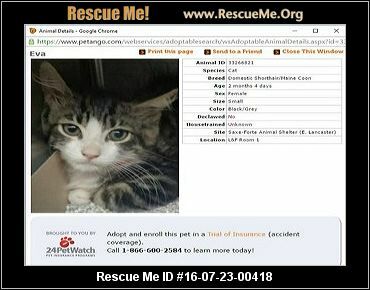 I would definitely recommend using this site to safely and carefully find loving homes for pets. If in the future we plan to adopt a new kitty, we are coming here first! 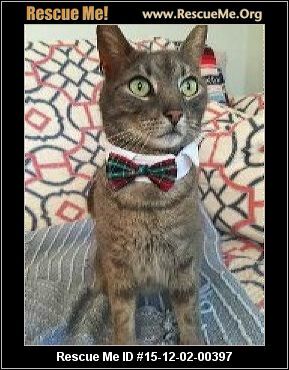 Thank you so much for allowing Ninny to be posted on your site for so long-I'm glad to share that he finally was adopted to a wonderful home yesterday-it looks as if he will be very spoiled and loved!